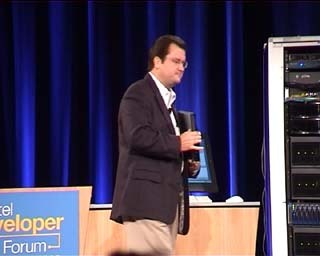 Today’s keynote was definitely a lot different than yesterday’s, no mobile computing, no talk about the convergence between computers and communication, today was all about servers and networking, or as Michael J. Fister, Senior Vice President at Intel put it; ten tons of Itanium. And there was indeed some heavy server equipment on stage such as the new Itanium 2 and of course the new Blade form factor rackserver that indeed promises to make a world of difference in rackmounted servers. The biggest plus being the fact that a defective Blade server can be replaced in a matter of seconds and be booting the OS shortly thereafter. Servicing a normal rackmounted server requires you to remove the server from the rack whereas the Blade form factor just allows you pull it out of the slot and replace it. The below video illustrates the difference quite dramatically as was shown during the keynote. Fig 1. Replacing a Blade form factor rackmounted server, versus a regular one. This movie requires the Windows Media player to be installed and requires a broadband connection for streaming playback. Mike Fister then proceeded to talk about Itanium 2, Madison and of course the follow-up to Madison, Montecito which will be based on the 90-nm process and feature up to half-a-billion transistors, that’s one step away from the billion transistor CPU which will be a significant milestone in semiconductor complexity. With a transistor count that high on a 90-nm process we’ll be able to approach the neural density of the human brain and build processors that offer the same processing power per square inch as the organic equivalent. The rest of the day 802.11x wireless communication was the topic of choice. There were a number of sessions about the security issues with 802.11a and 802.11b and how to beef up security. And naturally a lot of talk about upcoming new standards such as 802.11e and UWB, Ultra Wide Bandwidth or affectionally called, Universal Wireless Bus. But also the most relevant issues concerning the worldwide deployment of 802.11, which basically comes down to tackling worldwide regulatory matters that prevent worldwide acceptance.